IT WAS a Chris Gayle show before Virat Kohli and AB De Villiers smashed half-centuries each at the IS Bindra PCA Stadium Mohali to set up a eight- wicket win for Royal Challengers Bangalore against hosts Kings XI Punjab in a IPL match on Saturday. 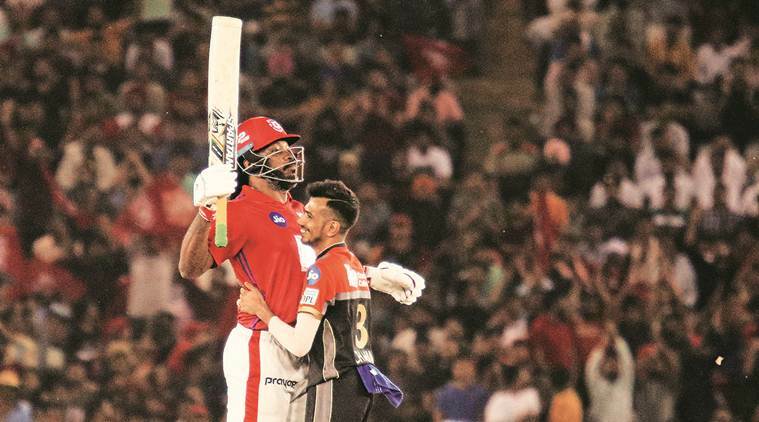 While Gayle played a smashing knock of 99 runs and guided Kings XI Punjab to a total of 173 for 4 in the allotted 20 overs, Kohli played a knock of 67 runs before De Villiers played an unbeaten knock of 59 runs to guide the visitors to their first win of this IPL season. It was Gayle’s third half-century of the season and his ten boundaries and five sixes made the crowd chant his name even during Royal Challengers Bangaluru batting before the crowd started cheering for Kohli and Devilliers. “It was my first time watching any IPL match here at PCA Stadium and it was thrilling to see Chris Gayle bat. Even though last match’s centurion KL Rahul missed out in this match, Chris Gayle showed that he is the most destructive T20 batsman in the world and that’s why he is called Universe Boss. 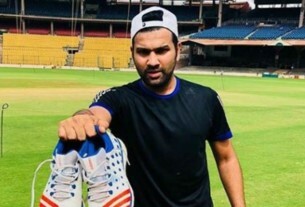 The way he smashed Mohammed Siraj for 43 runs off 16 balls was special and that was the reason that Kings XI Punjab posted a competitive total,” said 11-year-old Vishnu Vardhan Tewari, a sixth standard student of Strawberry Fields High School, Chandigarh. Kings XI Punjab had scored four wins out of their seven matches prior to Saturday’s match. With the home team bringing in Andrew Tye, M Ashwin and Nicholas Pooran for this match, KXIP had a good start in the match as the opening pair of Gayle and Rahul scored 60 runs in the power play. While no other Kings XI Punjab batsman could cross the 20-run mark, Gayle innings made the home team cross the 170-run mark in their innings. Chasing the target, Virat Kohli and Parthiv Patel made an explosive start to the innings as the team raced to 43 runs in 3.4 overs before Patel’s dismissal. Kohli and De Villiers were then associated in a 85-run run stand before De Villiers and Marcus Stoinis (28) guided the team to a eight-wicket win. “Royal Challengers Bangalore openers gave them a good start and Virat Kohli reminded us that why he is rated so highly even in this format. It was unfortunate that he got out at a crucial point in the match. But with De Villiers at the crease, we knew that that team can still win. He maintained his calm till the end and guided the team to win. In 2016, the team reached the finals after winning six games out of their last seven matches and we hope this win will add to their confidence and they can repeat the same,” said Aditya Goyal, a banker from Moga, who had come to see the match. Meanwhile, an enthusiast fan made his way on to the field while Virat Kohli and AB de Villiers were batting during the Royal Challengers Bangalore innings. The fan tried to hug Kohli before security officials caught him and gave him to police. It was chaos at some of the gates outside the stadium as there was too much rush of fans and the police officials were also seen helping some fans without tickets enter the stadium. “We had valid tickets but there was no seat for us in Gate 5 block. Some police officials were also helping people without tickets entering the stadium. If every ticket is numbered, how can be there more than 200 persons left standing in some stands and without seat? It was the same in almost all the general stands,” said Rahul Arora, a Jalandhar resident.